We analyse whether the origin of immigrants and/or their level of assimilation to the host country (birth and naturalisation) can explain labour market trajectories. Among the manifold domains in which individuals with a migration background may face disadvantages, we focus on labour market re-integration because it has been proven to be a key factor in fostering long-term social integration into the host country. Although empirical evidence for discriminatory practices by employers is generally difficult to provide with registry data, our design minimises potential alternative explanations. Our study benefits from a unique dataset combining registry and survey data, which were collected in the Swiss Canton of Vaud among all newly unemployed individuals between February and April 2012. The findings are based on real labour market behaviour and show that when controlling for encompassing information on human and social capital and other employability criteria, individuals whose provenance is from outside the European Union face periods of unemployment that are up to 50% (or 3 months) longer than those of Swiss natives. Surprisingly, observable assimilation proofs in the form of naturalisation or birth in the host country do not improve labour market re-integration. We explain this finding by employers’ discriminatory hiring behaviour. The online version of this article ( https://doi.org/10.1007/s10888-018-9401-2) contains supplementary material, which is available to authorized users. 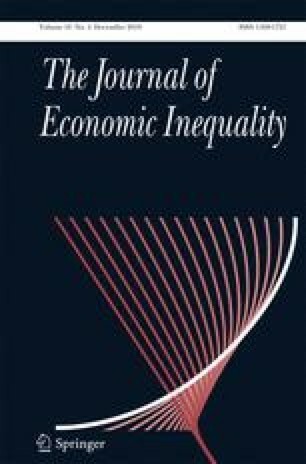 We are grateful to the editors and anonymous reviewer of the Journal of Economic Inequality, to Didier Ruedin, Giuliano Bonoli, Fabienne Liechti, Delia Pisoni, Philipp Trein, Anna Wilson, Johannes Kunz, Hanna Schwander and the participants in the “Social Policy in Switzerland and Abroad” panel at the Swiss Political Science Conference 2016 in Basel and to the participants in the 2017 conference on “Interdisciplinary Perspectives on Discrimination in the Context of Migration and Mobility” in Neuchâtel for comments on previous versions of this paper. The data used in this contribution are based on research carried out by Giuliano Bonoli, Patrick Arni, Rafael Lalive, Daniel Oesch, Pierpaolo Parrotta, Nicolas Turtschi, and Anna von Ow, whose project was financed by the Swiss National Centre of Competence in Research LIVES – Overcoming vulnerability: life course perspectives, which is financed by the Swiss National Science Foundation. Additional funds were provided by the Swiss State Secretariat for Economic Affairs (SECO) and logistical support by the Public Employment Service of the Canton of Vaud. This research has been carried out in the context of the NCCR – on the move, which is financed by the Swiss National Science Foundation.